Tears make the eye’s surface smooth and optically clear. 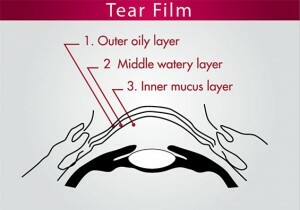 Each layer that comprises the normal tear film has an important function that is necessary for good vision. 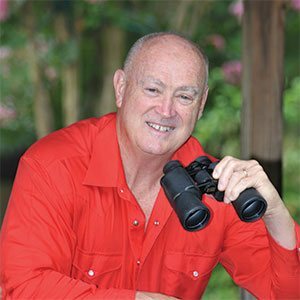 The outer oily layer is the first “lens” or optical surface that light passes through when entering the eye. The middle watery layer keeps the eye moist and flushes away foreign debris. The inner mucus layer serves as a reservoir for the external eye’s natural defenses against infection and inflammation. Patients with dry eyes may experience a multitude of symptoms, including burning sensations and redness; a feeling of sandiness or gravel in the eyes; vision that fluctuates with blinking; contact lens intolerance; excessive tearing. These symptoms often get worse when in dry or windy environments; after prolonged periods of reading; with the use of certain medications; or when working near or in heated and/or air-conditioned areas. Dry eyes occur when too few tears are produced or when the tears produced do not function normally. In either case, dry spots form on the outer surfaces of the eye. In most cases, there is no underlying disorder behind the dry eye. In some cases, dry eyes are associated with allergies, thyroid disease, arthritis and other connective tissue disorders. Although dry eyes cannot be cured, the tear film can be supplemented in an attempt to furnish the comfort that normally-produced tears provide. Artificial tears in drop or ointment form are frequently effective in treating dry eyes. Patients can benefit from the use of humidifiers in their home or office, and side shields on their eyeglasses. Spectacle lenses should be treated to protect the surface of the eye from harmful ultraviolet and infrared radiation. In many cases, temporary or permanent closure of the tear drains helps preserve the natural moister layer of the eye. In severely dry eyes, combinations of all these treatment options may be necessary. Recently, punctal plugs have been introduced as a novel treatment for severe dry eyes. The plug fits in the tear canal, unseen and unfelt, and allows the tear layer of the lower lid to rise to normal comfortable levels. Ask your doctor if you may be a candidate for this new treatment for the very old problem of dry eyes.